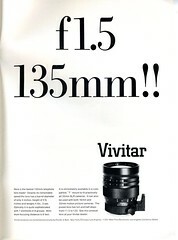 The Vivitar Professional 135mm f/1.5 lens is a rare telephoto lens marketed by Ponder & Best. "Vivitar Professional" was a name applied to only a few, rare lenses by Ponder & Best (aka Vivitar). The Vivitar Professional 135mm f/1.5 lens is highly sought after by collectors and generally fetches a very high price in auctions due to its rarity. Opinions of the quality of the lens vary. The identity of the manufacturer is unknown; however, the lens is marked "Made in Japan". It is not known exactly how many were produced. Second-hand accounts of total production numbers vary from under 100 to the low hundreds. The known serial numbers suggest that at least 197 were produced in 1967, less than 100 in each of 1969 and 1970. Only a handful of surviving examples are known (see serial number list below). "This is no general purpose lens. First, It's huge - five inches long, four inches wide, weighing a hefty four pounds, eight ounces. Second, it's pre-set. But this should present no problem, since you'd be foolish to use (and pay the price for) a lens specifically designed for speed at any but its widest apertures. A lens with this much glass area gives less than optimum performance under a bright sun, due to inevitable flare. Even inside use a lens hood. Mechanically, this Vivitar is superb. But this is to be expected, since the lens was originally made for NASA, to rigid government specifications." 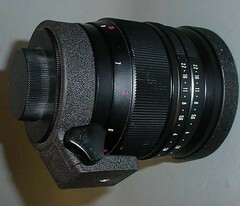 Modern users of the lens confirm that the result is soft when the lens is wide open, but the lens is now primarily a collectors' item and rarely used. While the manufacturer is currently unknown, the same lens was imported to the US by Chicago company Burke & James, Inc. under the Carl Meyer brand. The Vivitar and Carl Meyer versions were identical except for branding marks and mount. 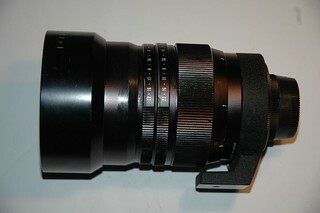 The Carl Meyer lens has an M42 mount rather than T mount. Because this lens is both very rare and very sought after by collectors, it seems worthwhile to describe the small number of known examples. These are listed in chronological order by serial number. The serial numbers for this lens are made up of the four-digit year of production followed by the sequential number of production for that year. The one exception to the numbering system is number 19671001, which has other minor differences with the usual production version of the lens and is believed to be a prototype. If you have further information on any of these copies or can provide information on other copies not yet listed, please feel welcome to add to this listing. 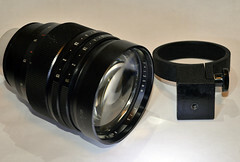 Lenshood-replacement: The universal lenshood for Zeiss Jena Sonnars 300/4 and 180/2.8 can be used by removing 86-95-adapter. There is a cap. 19671001 - In 2009, Andrej Korencc, said he purchased this example with a Nikon F T mount adapter and it was in very bad condition with scratches, dust, and fungus on the glass. He had it disassembled, cleaned, and some elements polished by Fotomehanika camera services in Slovenia. After reconditioning, Korencc reported that the lens functioned very well and he subsequently sold it. In 2010, Vilhelm Sjostrom was the apparent owner and posted photos to his flickr account, which appear below with his permission. This example does not have the usual "Vivitar Professional" badging, tripod ring, lens hood, or lens cap. It has an unusual serial number, suggesting it may be a prototype that preceded the first production run. Additional photos of this example were posted on the Nikonians forum. 196752 - This example shows substantial wear and is missing one of the aperture preset rings. The lens hood and tripod ring are also missing. 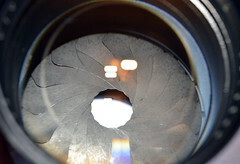 Front lens element is described as having "heavy amount of cleaning marks and light scratches" and a 1mm area of fungus. Rear element has larger, crescent-shaped area of fungus. Listed on eBay in May, 2014 with a buy it now price of $1199.00 USD by kehoutlet. 196767 - This example shows significant wear and was described as having fungus on rear elements. Tripod mount and lens hood are missing. Lens cap is included but due to wear and damage, does not fit properly. Sold on eBay 17 Feb, 2012 for $720 USD by lostintheozarks of Joplin, MO. 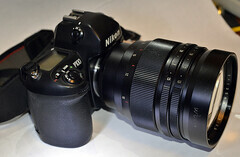 This lens was spotted on eBay again in March, 2012 as a buy it now listing for $849.99 USD. The listing was removed after 9 declined offers. 1967124 - This example is described as being in "decent cosmetic condition" but with "dirt inside lens" as well as signs of wear such as scuff marks. It was listed on eBay in Feb, 2016 for $1,379.00 USD by KEH Camera of Smyrna, GA.
1967197 - This example lacks the tripod ring, lens hood, and lens cap. Sold on eBay 8 Jan, 2012 for $888.88 USD by phytorx of Tucson, AZ. 196811 - This example is mentioned in a Yahoo lens forum in 2005 but no details of condition were given.. In December 2011, it was reported sold on eBay. 196819 - This example is said to be in good condition. Includes tripod ring and lens hood but lens cap is missing. Sold on eBay 12 Feb 2012 for $932 USD by phytorx of Tucson, AZ. 196825 - This example was reported sold on eBay UK in the summer of 2011. 197001 - This example was sold on eBay in August 2011 by Reed Drummond, who granted Camera-wiki.org permission to use his auction photos here. This example is missing the lens hood. It includes the tripod ring and lens caps. A previous owner has engraved some numbers and letter on the outside of the barrel near the front of the lens. At the time of the auction, glass looked clean with a slight amount of internal dust visible. 197003 - This example was posted on eBay by mrwebs in January of 2013. Is sold for $1,250 USD. The lens was described as having "small marks on the body". It also has an alphanumeric value engraved by a previous owner near the front of the barrel. Otherwise it was described as being in good mechanical condition with clear glass. Tripod ring and rear lens cap were intact but the hood and front lens cap were missing. 197012 - Photos of this example were posted to the Manual Focus lens forum in September of 2009 by user taunusreiter. There is no lens cap on this example. The lens hood and tripod ring were present. 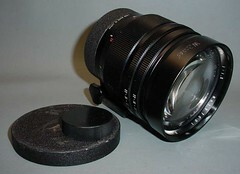 The lens barrel appears in remarkably new condition and the glass appears clean and clear. This example was last seen in a German eBay auction where it sold on 18 Dec 2011 for €699. 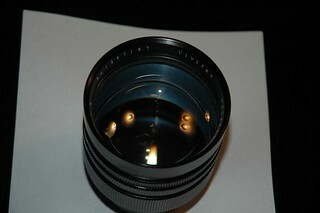 At the time of the auction, the lens included the original Vivitar packaging. 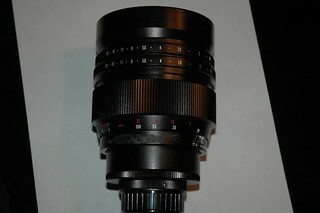 197027 - This example was posted on eBay by gokevincameras in April of 2012 as a Buy-it-now listing for $1100 USD. There is no lens cap or hood. Filter ring is dented and front element has evidence of fungus and two chips of glass missing. Tripod mounting ring was not visible in photo and may be missing. Additional photos were posted online. ↑ Yahoo! 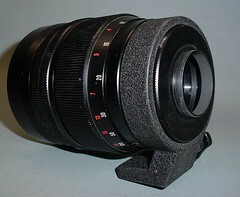 forum ManualMinoltaFree: That's a lens! Vivitar Professional 135mm f/1.5 lens, Fred Miranda forum. Photos of the lens and taken with the lens. Vivitar Professional 135mm f/1.5 lens, Nikonians forum. 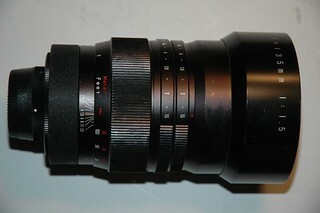 Rangefinderforum.com: Vivitar Professional 135mm f/1.5 lens. Photo.net: Vivitar Professional 135mm f/1.5 lens. This page was last edited on 19 June 2017, at 05:31.